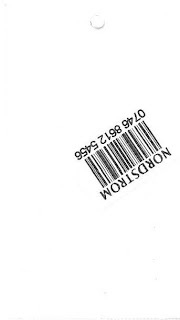 This hang tag is from Nordstrom Rack, the high end retailer’s budget concept. This tag is practical above all else. 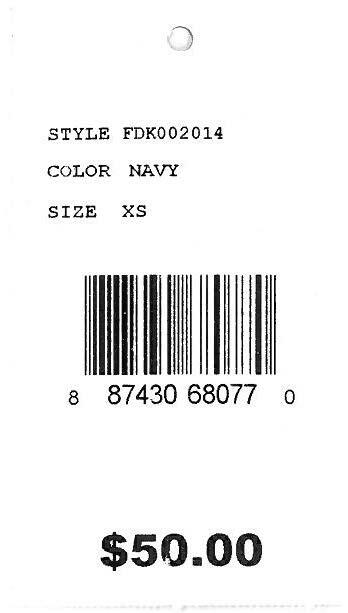 A style number, a color, a size, a barcode, and a price. A scientist cataloging dinosaur bones might appreciate it, but it looks out of place on fashion racks. Even the font lacks any sort of embellishment. The reverse is entirely blank. 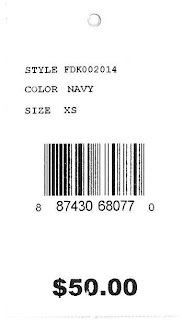 It does leave plenty of space for multiple label stickers, which may be a practical step as a discount store. Each time there is a new sale price, there is plenty of space to add the markdown and leave the original to allow consumers to see their savings. I just wanted to post this one for something a little bit different.